FOR A PDF Copy OF THE ORIGINAL ARTICLE, PLEASE CLICK HERE. Victor Teboul’s thoroughly researched book is a valuable contribution to the understanding of the ideological evolution of French Canada. In particular it illustrates the extraordinary foresight, intelligence and courage of editor Jean-Charles Harvey, who quite probably should be considered the founding father of contemporary Québec. The Globe and Mail, October 12, 1985, p. C6. Sutherland, Ronald. The Globe and Mail [Toronto, Ont] 12 Oct 1985: D.19..
Victor Teboul's candid analysis of the myths and images of the Jew in Quebec, published in 1977, created quite a stir. His latest book, astudy of the weekly newspaper called Le Jour, which was founded by Jean- Charles Harvey in 1937, deals with an equally controversial subject and is equally thorough and candid. Victor Teboul's candid analysis of the myths and images of the Jew in Quebec, published in 1977, created quite a stir. His latest book, astudy of the weekly newspaper called Le Jour, which was founded by Jean- Charles Harvey in 1937, deals with an equally controversial subject and is equally thorough and candid. One should be careful not to confuse Harvey's Le Jour, which lasted nine years until 1946, with the later Quebec nationalist newspaper of the same name, which was published as a daily from Feb. 28, 1974, to Aug. 24, 1976, then as a weekly from Feb. 4, 1977, to Jan. 13, 1978. The latter Jour claimed to be inspired by Harvey's paper, but in many respects it was the very opposite. Forone thing, Harvey was adamantly opposed to tribal Quebec nationalism. 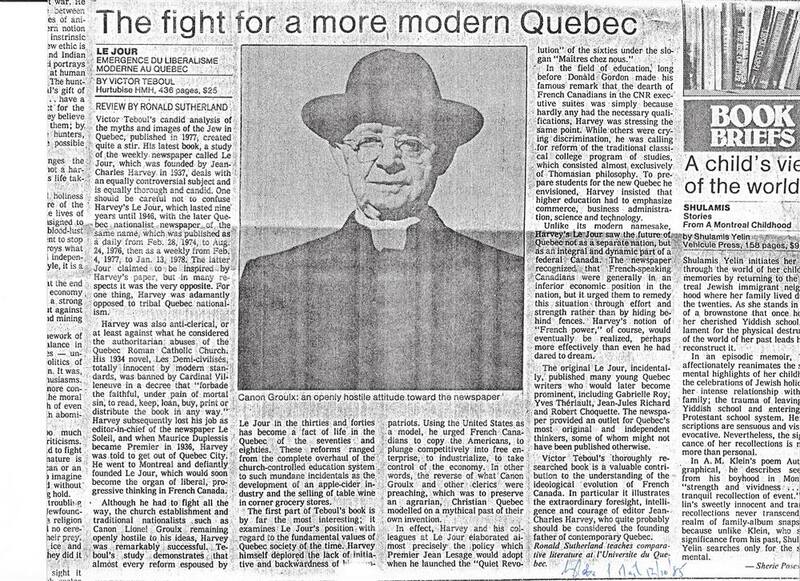 Harvey was also anti-clerical, or at least against what he considered the authoritarian abuses of the Quebec Roman Catholic Church. His 1934 novel, Les Demi-civilises, totally innocent by modern standards, was banned by Cardinal Villeneuve in a decree that "forbade the faithful, under pain of mortal sin, to read, keep, loan, buy, print or distributethe book in any way." Harvey subsequently lost his job as editor-in-chief of the newspaper Le Soleil, and when Maurice Duplessis became Premier in 1936, Harvey was told to get out of Quebec City. He went to Montreal and defiantly founded Le Jour, which would soon become the organ of liberal, progressive thinking in French Canada. Although he had to fight all the way, the church establishment and traditional nationalists such as Canon Lionel Groulx remaining openly hostile to his ideas, Harvey was remarkably successful. Teboul's study demonstrates that almost every reform espoused by Le Jour in the thirties and forties has become a fact of life in the Quebec of theseventies and eighties. These reforms ranged from the complete overhaul of the church- controlled education system to such mundane incidentals as the development of an apple-cider industry and the selling of table wine in corner grocery stores. The first part of Teboul's book is by far the most interesting; it examines Le Jour's position with regard to thefundamental values of Quebec society of the time. Harvey himself deplored the lack of initiative and backwardness of his compatriots. Using the United States as a model, he urged French Canadians to copy the Americans, to plunge competitively into free enterprise, to industrialize, to take control of the economy. In other words, thereverse of what Canon Groulx and other clerics were preaching, which was to preserve an agrarian, Christian Quebecmodelled on a mythical past of their own invention. In effect, Harvey and his colleagues at Le Jour elaborated almost precisely the policy which Premier Jean Lesage would adopt when he launched the "Quiet Revolution" of the sixties under the slogan "Maitres chez nous." In thefield of education, long before Donald Gordon made his famous remark that the dearth of French Canadians in theCNR executive suites was simply because hardly any had the necessary qualifications, Harvey was stressing thesame point. While others were crying discrimination, he was calling for reform of the traditional classical college program of studies, which consisted almost exclusively of Thomasian philosophy. To prepare students for the newQuebec he envisioned, Harvey insisted that higher education had to emphasize commerce, business administration, science and technology. Unlike its modern namesake, Harvey's Le Jour saw the future of Quebec not as a separate nation, but as an integral and dynamic part of a federal Canada. The newspaper recognized that French-speaking Canadians were generally in an inferior economic position in the nation, but it urged them to remedy this situation through effort and strength rather than by hiding behind fences. Harvey's notion of "French power," of course, would eventually be realized, perhaps more effectively than even he had dared to dream. The original Le Jour, incidentally, published many young Quebec writers who would later become prominent, including Gabrielle Roy, Yves Theriault, Jean-Jules Richard and Robert Choquette. The newspaper provided an outletfor Quebec's most original and independent thinkers, some of whom might not have been published otherwise. Victor Teboul's thoroughly researched book is a valuable contribution to the understanding of the ideological evolution of French Canada. In particular it illustrates the extraordinary foresight, intelligence and courage of editor Jean- Charles Harvey, who quite probably should be considered the founding father of contemporary Quebec. Ronald Sutherland teaches comparative literature at l'Universite du Quebec.